Bashkortostan, the first ethnic autonomy in Russia, was established on 28 November [O.S. 15 November] 1917. On 20 March 1919, it was transformed into the Bashkir ASSR, the first Autonomous Soviet Socialist Republic in RSFSR. In accordance with the Constitution of Bashkortostan and Russian Federation Constitution, Bashkortostan is a state, but has no sovereignty. On 11 October 1990 Bashkortostan adopted the Declaration of State Sovereignty, but subsequently abandoned it. 11 October is Republic Day in Bashkortostan. The name "Bashkortostan" derives from the name of the Bashkir ethnic group, also known as Başqorts. While the root of the name is Turkic (being a combination of 'baş', which in Turkish can mean head, chief, main, principal, and 'qort' meaning wolf, one of the animals regarded as sacred to Turkic peoples); the suffix -stan is Persian, common to many Asian country names. They speak the Bashkir language, which belongs to the Kypchak branch of the Turkic languages. The first settlements in the territory of modern Bashkortostan date from the early Paleolithic period, but the Bronze Age spurred an upsurge in the population of this territory. When people of the Abashevo culture started settling here they possessed high skills in manufacturing bronze tools, weapons, and decorations. They were the first to establish permanent settlements in the Southern Urals. Bashkortostan takes its name from its native people, the Bashkirs. The Slavonic name of the country, Bashkiriya, formed at the end of the 16th century. Originally it appeared in the forms Bashkir land, Bashkir’, Bashkirda and Bashkir horde. The ethnonym Bashkirs first became known in the 7th century. In the 10th century, Al-Balkhi wrote about Bashkirs as a people, divided into two groups, one of which inhabited the Southern Urals, while the other lived near the Danube river, close to the boundaries of Byzantium. His contemporary Ibn-Ruste described the Bashkirs as "an independent people, occupying territories on both sides of the Ural mountain ridge between Volga, Kama, Tobol and upstream of Yaik river". Cave paintings in the Shulgan-Tash Nature Reserve. Mausoleum of Turahan, 14th-century building. Bashkirs near Hamburg during the Napoleonic Wars, c. 1813. The Red Army cavalry unit, made up of Bashkirs, Russian Civil War, 1919. After the early-feudal Mongolian state had broken down in the 14th century, the territory of modern Bashkortostan became divided between the Kazan and Siberia Khanates and the Nogai Horde. The tribes that lived there were headed by bi (tribal heads). After Kazan fell to Ivan the Terrible in 1554–1555, representatives of western and northwestern Bashkir tribes approached the Tsar with a request to voluntarily join Muscovy. Starting from the second half of the 16th century, Bashkiria's territory began taking shape as a part of the Russian state. In 1798 the Spiritual Assembly of Russian Muslims was established[by whom? ], an indication that the tsarist government recognized the rights of Bashkirs, Tatars, and other Muslim nations to profess Islam and perform religious rituals. Ufa Governorate (guberniya), with a center in Ufa, was formed in 1865— another step towards territorial identification. After the Russian Revolution of 1917 were All-Bashkir Qoroltays (conventions) on which a decision on the need to create a national federal republic within Russia. As a result, 28 November 1917 Bashkir Regional (central) Shuro (Council) proclaims the establishment in areas with a predominantly Bashkir population of Orenburg, Perm, Samara, Ufa provinces territorial and national autonomy Bashkurdistan. In December 1917, delegates to the All-Bashkir (constituent) Congress, representing the interests of the population edge of all nationalities, voted unanimously for the resolution (Farman #2) of the Bashkir regional Shuro the proclamation of national-territorial autonomy (of the Republic) Bashkurdistan. The congress formed the government of Bashkurdistan, the Pre-parliament - Kese-Qoroltay and other bodies of power and administration, and decisions were made on how to proceed. In March 1919, based on the agreements of the Russian Government with the Bashkir Government was formed Bashkir Autonomous Soviet Socialist Republic. During the Soviet period, Bashkiria was granted broad autonomous rights— the first among other Russian regions. The administrative structure of the Bashkir ASSR was based on principles similar to those of other autonomous republics of Russia. On 11 October 1990, the Supreme Soviet of the Republic adopted the Declaration on state sovereignty of the Bashkir ASSR. On 25 February 1992, the Bashkir ASSR was renamed[by whom?] the Republic of Bashkortostan. On 31 March 1992, a Federative Compact "On separation of authorities and powers among federal organs of power of the Russian Federation and the organs of power of the Republic of Bashkortostan" was signed. On 3 August 1994, a Compact "On separation of authorities and mutual delegating of powers among the organs of power of the Russian Federation and the organs of power of the Republic of Bashkortostan" was signed. Shihan Toratau. 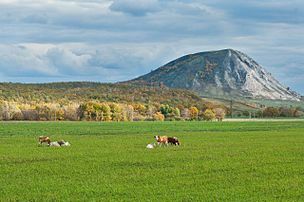 Single hills are popular symbols of Bashkortostan. 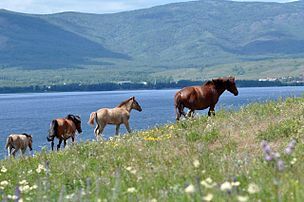 Bashkir horses near Yakty-Kul lake. The Republic of Bashkortostan is one of the richest territories of Russia in mineral resources with deposits of some 3,000 mineral resources. Bashkortostan is rich in crude oil reserves, and was one of the principal centers of oil extraction in the Russian Federation. Other major resources are natural gas, coal, ferrous metal ores, manganese, chromite, iron ores, non-ferrous metals ores (lead, tungsten), non-metallic ores (rock crystal, fluorite, Iceland spar, sulfide pyrites, barite, silicates, silica, asbestos, talcum), deposits of precious and semi-precious stones and natural stones (malachite, jade, granite). The republic has enough mineral resources to provide its power and fuel complex as well as petrochemical, chemical, agro-industrial complex, ferrous and non-ferrous metallurgy, glass-making and ceramic branches with raw materials. Bashkortostan is one of the major raw materials bases for Russia non-ferrous metallurgy. The republic has good deposits of lignite with a high degree of bitumen. This lignite can be used for obtaining a variety of different chemical products like resins, surface-active substances, gummy fertilizers, and other stimulants for plants growth. Mining-chemical raw materials (rock salt, lime, phosphorites, barytes, etc.) are quite substantial, and are utilized in the republic economy. Bashkortostan is also rich in woods. The total territory covered with forests is about 62,000 square kilometers (24,000 sq mi). More than one-third of the republic territory is covered with woods. The following types of trees dominate: birch tree, conifers, lime, oak, and maple. The general stock of timber according to some evaluation is 717.9 million m³. 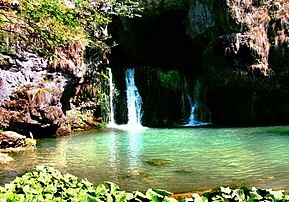 Bashkortostan forests have special sanctuaries and national parks. They cover more than 10,000 square kilometers (3,900 sq mi). The Asselian Age at the start of the Permian Period of geological time is named after the Assel River in Bashkortostan. The ski resort "Abzakovo" in Abzelilovsky District. October 2009. Morning fog in Ishimbaysky District. Building of the Government of the Republic also known as Bashkir White House. The head of the government of the Republic of Bashkortostan is the Head (before 1 January 2015 the title was called "President"), who is elected by the people for a four-year term. According to the Constitution, the Head of the Republic of Bashkortostan guarantees rights and liberties of the country's people and citizens, protects economic and political interests of the Republic of Bashkortostan, and secures legitimacy, law, and order within its territory. Rustem Khamitov assumed office on 19 July 2010. His predecessor was Murtaza Rakhimov, elected on 17 December 1993. Before the elections, Rakhimov was the Chairman of the Supreme Soviet of the Republic, the highest post at that time. Rakhimov was re-elected in December 2003 in a poll condemned by the OSCE for exhibiting "elements of basic fraud." The Republic's parliament is the State Assembly—Kurultai, popularly elected every five years. The one-chamber State Assembly has 110 deputies. The Republic's Constitution was adopted on 24 December 1993. Article 1 of the Constitution stipulates that Bashkortostan is a sovereign state within Russia, it has state power beyond the limits of authority of the Russian Federation and the powers of the Russian Federation concerning the aspect of the joint authority of the Russian Federation and the Republic of Bashkortostan. The Republic of Bashkortostan is a full-fledged subject of the Russian Federation on equal and agreed bases. The relations of the Republic of Bashkortostan and the Russian Federation are at present based on the articles of the Constitution of the Russian Federation, the Constitution of the Republic of Bashkortostan, the Federative Treaty (with amendments) and the Agreement on Separation of authorities and powers and mutual delegating of powers among the organs of state power of the Republic of Bashkortostan. In full accord with universally recognized principles of international law, articles of the European Charter of Local Self-Government and the Constitution of the Russian Federation, the Republic of Bashkortostan ensures in its Constitution that local self-government is recognized and guaranteed within the republic's territory. The Republic of Bashkortostan resolves all issues of administrative-territorial structure on its own. The list of districts and towns, municipalities, as well as the order of establishing, amending and changing borders of municipalities and their names, are stipulated by the Republic of Bashkortostan law "On administrative-territorial structure of the Republic of Bashkortostan and territory of municipalities". The state has strong economic and cultural ties with its western neighbour the Republic of Tatarstan. Sunflower field in Ishimbaysky District. Bashkortostan has a developed agriculture. Bashkortostan is one of the most developed regions of the Russian Federation in terms of its gross regional output, the volume of industrial production, agricultural production, and investment in fixed assets. The largest companies in the region include Bashneft (revenues of $9.57 billion in 2017), Ufa Engine Industrial Association (part of United Engine Corporation; $1.26 billion), Peton Holding ($1.04 billion), Bashkhim ($857.04 million), Ufaorgsintez ($473.09 million), Beloretsk Iron and Steel Works ($409.67 million). The extraction of crude oil in Bashkiria began in 1932. At the end of 1943 large crude oil deposits were discovered. [by whom?] During the Great Patriotic War of 1941 to 1945, Bashkiria became one of the major regions of the Soviet Union to accommodate plants and factories evacuated from Western Russia, as well as great masses of people, while also providing the country with weaponry, fuel, and foodstuffs. After the war, a number of industries developed further in Bashkiria, such as mining, machine-building and (especially) oil-refining. Bashkiria's industry became a solid base for the further economic growth of all European outlying territories of Russia. The economy of Bashkortostan, being one of the largest industrial centers of Russia, is very diverse. Bashkortostan has a large agricultural sector. But the republic's most important industry is chemical processing; Bashkortostan produces more oil than any other region of Russia, about 26 million tons annually, and provides 17% of the country's gasoline and 15% of its diesel fuel. Other important products manufactured in Bashkortostan include alcohols, pesticides, and plastics. Bashkortostan's gross regional product in 2016 was 1.34 trillion rubles, making the republic the subject with the ninth highest GRP in Russia. The state had a positive trade balance, with $13.7 billion exported and $1.2 billion imported in 2013. 82.9% of enterprises in Bashkortostan are profitable, higher than the nationwide average of 68.42%. Bashkortostan has been recognized as the subject with the lowest economic risk. Bashkortostan is among the leaders in real estate development, developed electric power industry and tourism. According to Forbes, Ufa is the best city in Russia for business among cities with a population of over one million (2013). GRP structure of Bashkortostan for 2013. Ka-31 helicopter, produced in Kumertau. DT-30 amphibious ATV, made in Ishimbay. AL-41F1 engine for PAK FA fifth-generation fighter and Su-35S, produced in Ufa. Nefaz-VDL bus of Neftekamsk Automotive Plant. Bashkir village on the Inzer river. Note: Total fertility rate 200-12 source. 1 97,572 people were registered from administrative databases, and could not declare an ethnicity. It is estimated that the proportion of ethnicities in this group is the same as that of the declared group. According to the 2010 Census, spoken languages: Russian (97%), Tatar (26%), Bashkir (23%). Islam is adhered to by a plurality of the nation's population of Bashkir and Tatar descent. The Muslims of Bashkortostan follow Sunni Hanafi school of Islamic law. Most ethnic Russians, Chuvash, and Ukrainians are Orthodox Christians. Most Mari are Pagan. Non-religious people form a substantial part of any ethnic group in Bashkortostan. There are 13,000 Jews in the republic, with a historic synagogue in Ufa, and a new Jewish Community Center built in 2008. According to a 2012 survey which interviewed 56,900 people, 38% of the population of Bashkortostan are Muslim, 25% adhere to the Russian Orthodox Church, 3% are unaffiliated generic Christians, 1% are Orthodox Christian believers without belonging to any church or members of other Orthodox churches, and 2% are adherents of the Slavic native faith (Rodnovery), the Mari native religion, Chuvash Vattisen Yaly or Tengrism. In addition, 15% of the population declare to be "spiritual but not religious", 8% are atheist, and 7% follow other religions or did not give an answer to the question. Note, however, that this survey has been criticized as biased. It was conducted by the service "Sreda", which has ties to the Christian organizations. In 2010, there were over 1,000 mosques in Bashkortostan, 200 Orthodox churches and 60 religious buildings of other confessions. Russian Premier League football club FC Ufa is from Ufa. KHL team Salavat Yulaev Ufa plays in the city, as does Supreme Hockey League teams Toros Neftekamsk and HC Gornyak Uchaly, Minor Hockey League team Tolpar Ufa and Russian Women's Hockey League team Agidel. National Junior Hockey League Hockey club Batyr is from Neftekamsk. Russian Volleyball Super League team Ural and volleyball team Samrau-UGNTU are from Ufa. Russian Handball Super League team Ugntu-VNZM and Russian Women's Handball Super League team Ufa-Alisa are from Ufa. Formula One driver Daniil Kvyat hails from Ufa. It was decided in 2018 to revive bandy. There are even preliminary plans for building an indoor arena. About sixty scientific organizations are active in the republic. Fundamental and applied scientific research is underway at twelve institutes of the Russian Academy of Sciences, twenty-nine institutes of different branches of industry, as well as numerous design bureaus and organizations, universities, and colleges. Bashkir State Academic Theater of Drama in Ufa. Bashkortostan is home to song and dance companies, a network of national theaters, museums, and libraries, and a number of annual folk festivals. The republic has seven Bashkir, four Russian, and two Tatar State Drama Theaters, a State Opera and Ballet Theater, a National Symphony Orchestra, "Bashkortostan" film studio, thirty philharmonic collectives, and the Bashkir State Folk Dance Ensemble. Bashkir literature is the literary tradition of the Republic of Bashkortostan. ^ Ведомости (October 11, 2018). "Путин назначил врио глав Курской области и Башкирии". Retrieved October 11, 2018. ^ a b "Republic of Bashkortostan (Russia): Population, Cities and Settlements - Population Statistics, Charts and Map". www.citypopulation.de. Retrieved February 19, 2019. ^ Зулькарнаева Е. З., Кульшарипова Н. М. Фарман. // Башкортостан: краткая энциклопедия. — Уфа: Башкирская энциклопедия, 1996. — С. 603. — 672 с. — ISBN 5-88185-001-7. ^ "President of Russia". Archived from the original on January 8, 2016. Retrieved January 24, 2016. ^ "Конституция Республики Башкортостан от 24 декабря 1993 г. N ВС-22/15 / Глава 1. Основы конституционного строя Республики Башкортостан". Retrieved January 24, 2016. ^ "Парламентарии Башкирии приняли Закон "О Главе Республики Башкортостан"". Bashinform NA. December 25, 2014. Retrieved January 8, 2015. ^ "Просмотр публикации : Республика Татарстан". Retrieved January 24, 2016. ^ 127-creatiVe. "IslamRF.ru: Татарстан и Башкортостан в первой половине 2012-го года: от альянса в экономике к сотрудничеству в сферах языка и религии". Retrieved January 24, 2016. ^ "Президент РТ". Archived from the original on January 31, 2016. Retrieved January 24, 2016. ^ "Вести.Ru: Башкортостан признан регионом с минимальными экономическими рисками". vesti.ru. Retrieved January 24, 2016. ^ "Title". Retrieved January 24, 2016. ^ "Ввод жилья в России - 2014: рейтинг регионов по итогам III квартала". Retrieved January 24, 2016. ^ "Сайт газеты "Республика Башкортостан" - Экономика - "Позеленеет" ли энергетика?". Retrieved January 24, 2016. ^ "Республика Башкортостан". Archived from the original on January 30, 2016. Retrieved January 24, 2016. ^ "Bashkortostan Republic, Russia guide". russiatrek.org. Retrieved February 19, 2019. ^ "Каталог публикаций::Федеральная служба государственной статистики". Retrieved January 24, 2016. ^ "ВПН-2010". Retrieved January 24, 2016. ^ "islamonline.com". Retrieved January 24, 2016. ^ "Социологические опросы "Среды", или кто заказывает "магию цифр"?!". Русская народная линия. Информационно-аналитическая служба. September 6, 2012. ^ "Интерфакс-Религия: Говорить о притеснении ислама в России кощунственно, считает Талгат Таджуддин". Retrieved January 24, 2016. ^ "25.08.2010 :: События :: Духовное управление мусульман Республики Башкортостан - Официальный сайт". Retrieved January 24, 2016. ^ Julie Kavanagh (2011). Nureyev: The Life. Random House. p. 51. Retrieved March 27, 2014. A celebration of Bashkirian Literature and Art to be held in Moscow..
^ Christopher Barnes (2004). Boris Pasternak: A Literary Biography, Volume 2. Cambridge University Press. p. 118. Retrieved March 27, 2014. The main themes of the meeting were the discussion of the state of Byelorussian and Bashkirian literature..
Ilishev, Ildus G. (December 1998). "Russian federalism: Political, legal, and ethnolingual aspects — a view from the republic of Bashkortostan". Nationalities Papers. 26 (4): 723–759. doi:10.1080/00905999808408597. Wikimedia Commons has media related to Bashkortostan.